This pair of cabinets consist of satin birch tops with a moulded edge leading down to a mahogany lined drawer, the drawer fronts with a moulding surrounding a central panel of decorative inlaid stringing with two brass drop handles of Aesthetic style. Below is an open shelf with carved column feature to either side with moulded panel to the rear of the open section. This leads down to a door with two moulded panels with inlaid scrolling, floral and foliate decoration (of Aesthetic influence) with brass drop handle as above, the door opening to reveal two mahogany lined and removable sliding trays. This leads down to a shaped frieze below, each cabinet being supported by four tapered feet with brass and ceramic castors. The Aesthetic Movement (1860-1900) championed pure beauty: art existed for the sake of it's beauty alone emphasising the visual and sensual qualities of art & design over practical and political purposes etc. - Liberty of London was a major stockist of Aesthetic style items and furniture. 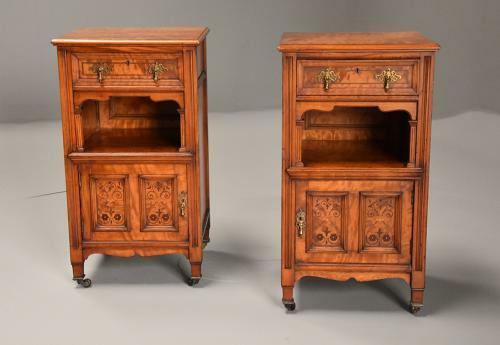 This pair of cabinets are in excellent condition for age, are of stable construction and can go straight into a home.